Is it really possible to photograph the aura? Nowadays many people are skeptical about the possibility of photographing the human aura. Even those who do not deny the existence of the aura as such, often consider it impossible to capture in any way such a delicate substance. It is well known that changes in a person’s physical or emotional state are accompanied by a change in the number of his physiological characteristics, including electro-dermal activity and temperature. Besides, each person is characterized by certain average values of these parameters. It is this bio data that is captured by the MbGA aura sensor. In long term research studies each bio data range was assigned a certain color. Thus, a photo taken by the MbGA aura sensor depicts the human bio field; practically it is a visualized result of the measurement of physiological parameters, captured by a biosensor from a palm of the left hand. How exactly is an aura photo taken? A person puts the palm of his left hand on a special panel containing a number of sensors capturing his bio data. A special software program, that was designed based on many years of research, analyzes the information obtained and displays the result in the form of images of the aura and chakras, charts and graphs, and also generates a text report. Why do people take photos of the aura? The MbGA aura sensor is an excellent supplemental research tool for a number of professionals: psychotherapists, psychologists, healers, business coaches, human resources managers, physicians, as well as in healing and wellness centers, beauty salons, esoteric stores, shopping centers, etc. The visualization of the results will help their patients or clients to be more informed and active in solving their problems or achieving their goals. Not only the MbGA aura sensor can help to make your establishment original, but it can also provide you with a constant income stream. The MbGA aura sensor is often purchased by people engaging in spiritual practice and constantly monitoring their consciousness level. Which MbGA aura sensor to buy? 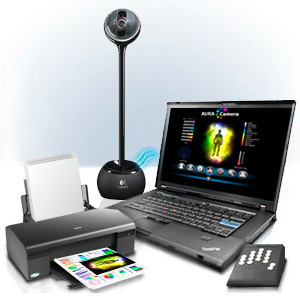 The kit includes: Auracamera (aura sensor), Software, Technical support and the lifetime warranty (remote access programs), Training course with our teacher (the essential information about operating aura camera and its data interpretation). After training you will receive the certificate confirming that you know how to work with auracamera). Delivery within 4-5 days via courier mail service. © 2009-2018, Questland. Aura Camera MBGA is not a medical device, and is used in educational purposes.